The third bomb blast outside the residence of Jamshed Baghwan, bureau chief of Express News channel in Peshawar, since March 2014 is a serious matter of concern, Freedom Network, Pakistan’s first media watchdog organization, [FN] said Wednesday (02 July 2014) in its press freedom alert. “The attack is a clearly directed against a media-person and perpetrators of the crime must be brought to justice to fight serious issue of impunity in Pakistan,” the organization demanded. The house of Jamshed Baghwan, bureau chief of Express News TV channel in Peshawar, was damaged Wednesday (July 02, 2014) in a bomb attack. “Thanks God, I and my family members are all safe,” Jamshed Baghwan told FN after the blast just outside the main gate of his residence in Peshawar. The bomb was attached with timer device going off at 11am (local time). “Around one kilogram of explosives was used in the attack,” the senior journalist said. It was the third attack targeting the journalist’s house in Peshawar since March this year. The first bomb blast outside his house had taken place on March 20 and second on April 6, 2014 respectively. Motorcycle-riding persons had placed the explosives, concealed in a milk pack, outside the residence of the journalist and fled from the scene second before the bomb exploded with a big bang, local police said. The intensive blast shattered window panes in the locality, caused damage to the exterior of the house and the journalist’s vehicle parked inside the home. “I am clueless as to why these elements are targeting my house. I see no reason to believe that these attacks unrelated to my profession,” the journalist spoke of possible reasons behind the attacks. No group has accepted responsibility for any of the three attacks. However, police investigators believe the same group is involved in these attacks. “Today’s blast was bigger than previous blasts,” Express News channel’s bureau chief said. Emergency and security teams reached the attack site and cordoned off the area as a probe into the incident went underway. Express group has been under attack from suspected sectarian and other groups, including the banned terror organization Tehreek-e-Taliban Pakistan (TTP) since last year attacking the group’s offices in Karachi and killing three staff members on January 17 this year in Karachi. Liberal journalist Raza Rumi, who was anchoring a talk-show programme on Express News channel, has had a narrow escape when gunmen targeted him in Lahore city on March 28 this year. Raza Rumi left the country for security reasons soon after the attack. 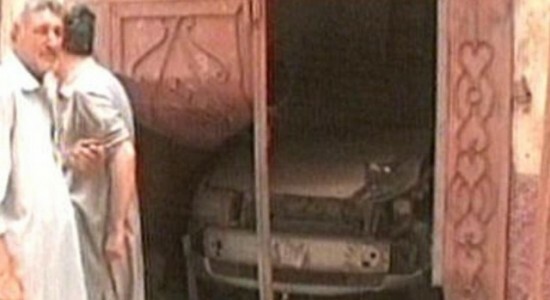 A scene of damaged main gate and parked vehicle of Jamshed Baghwan after timed device went off outside his residence in Peshawar on Wednesday (02 July 2014).